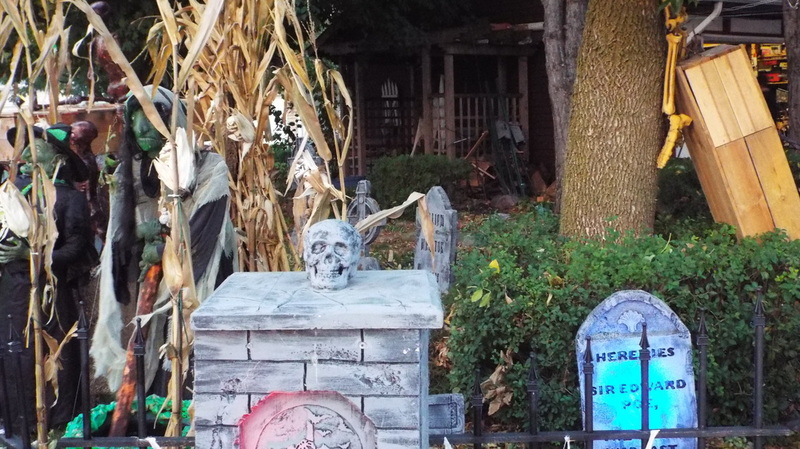 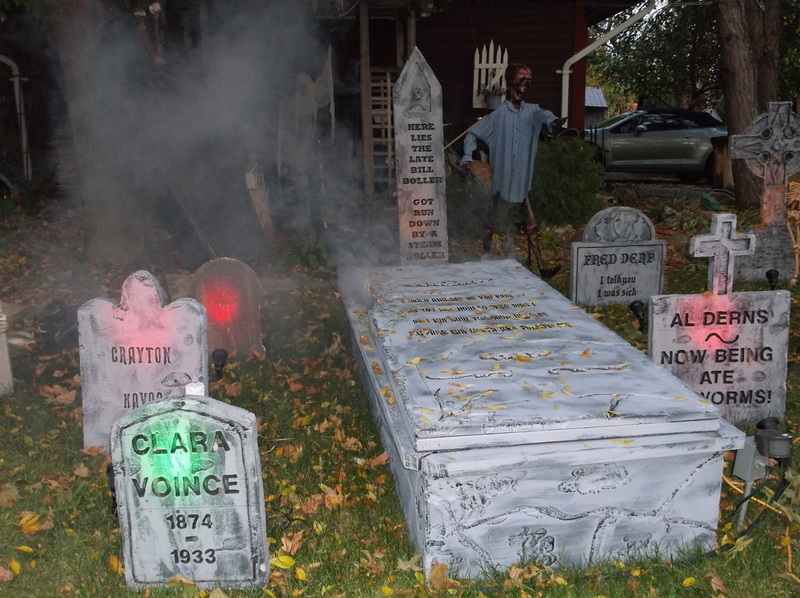 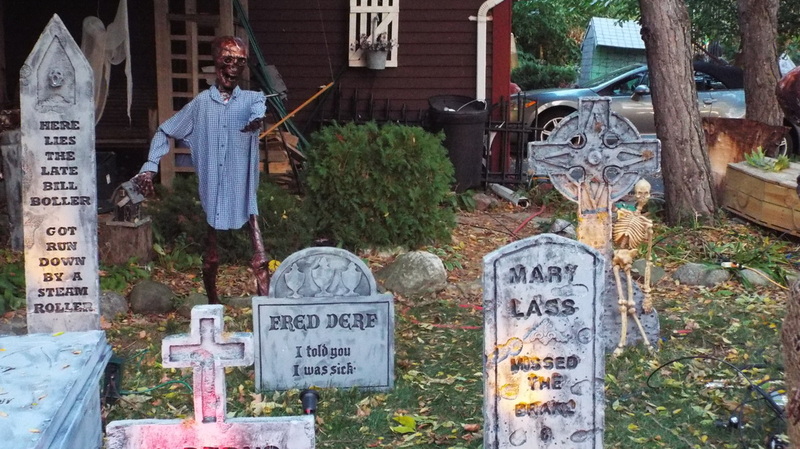 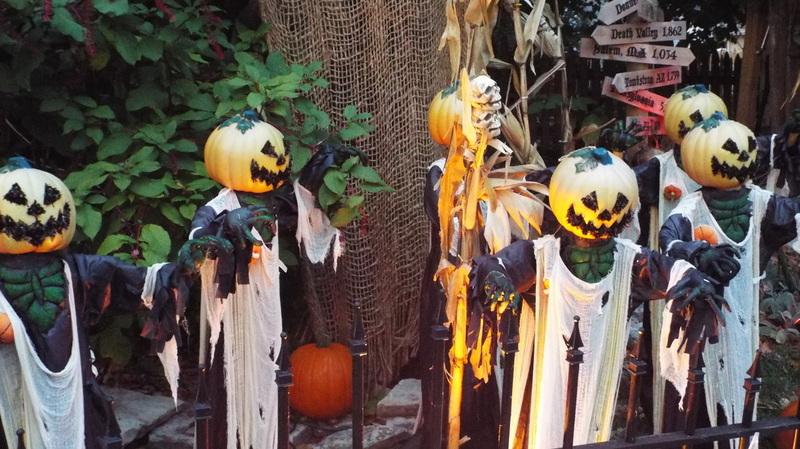 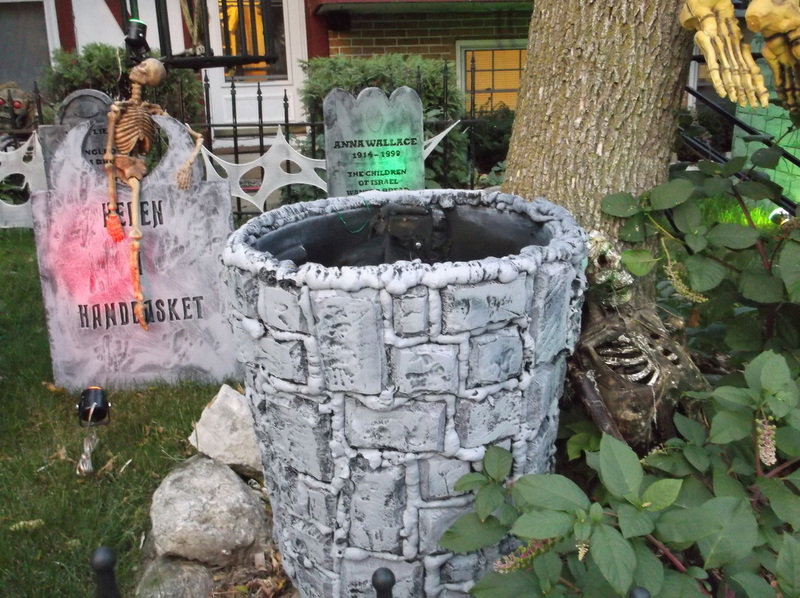 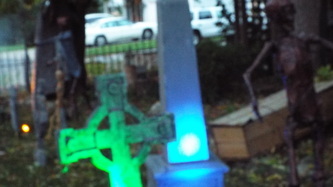 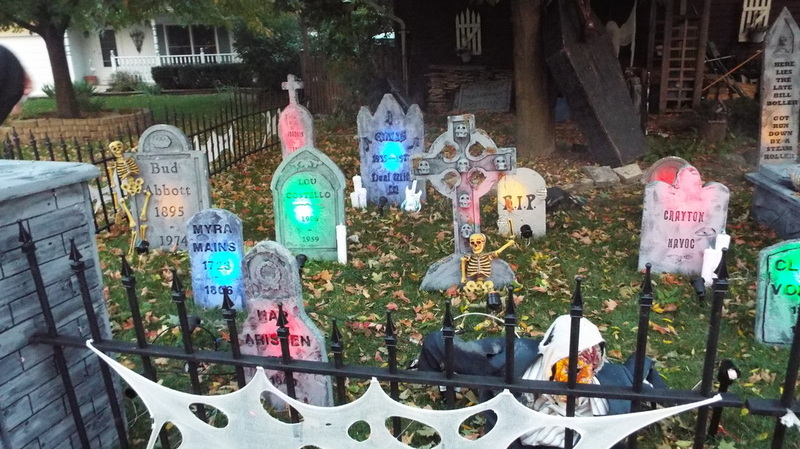 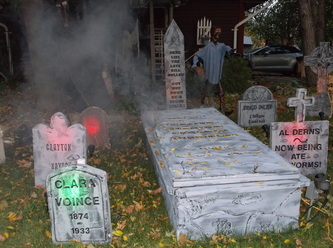 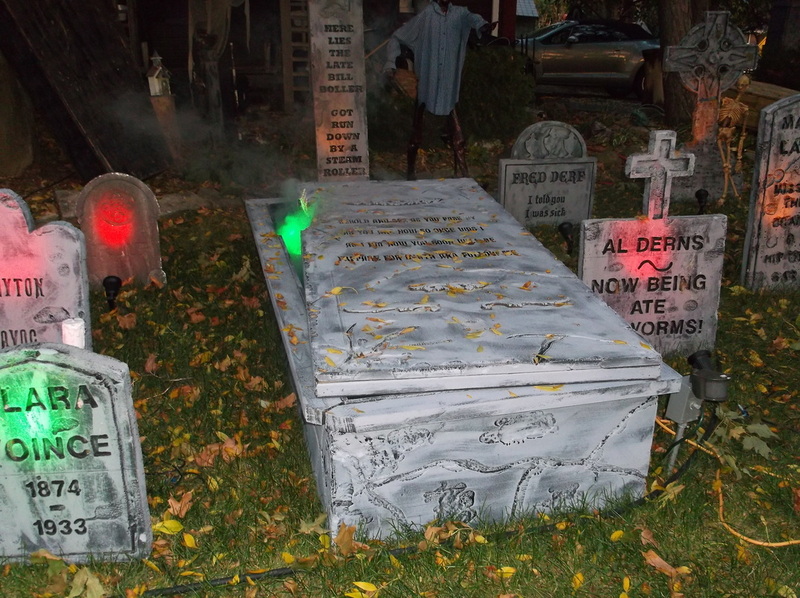 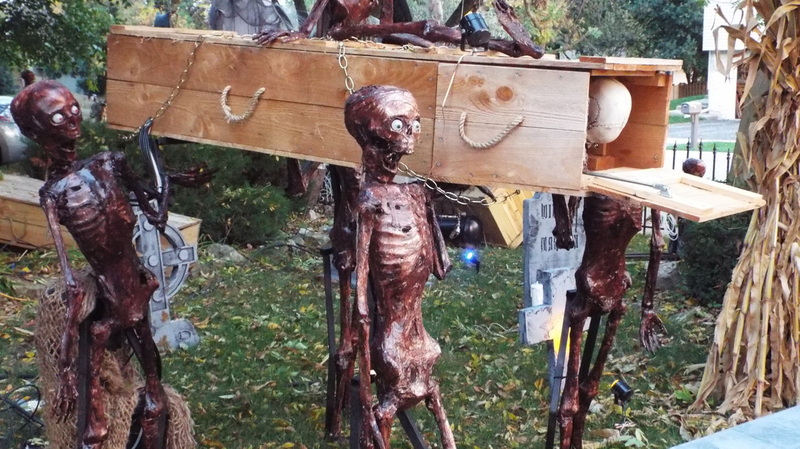 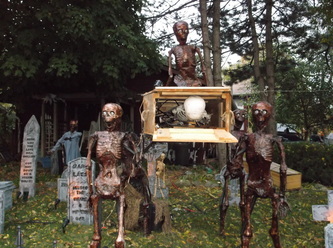 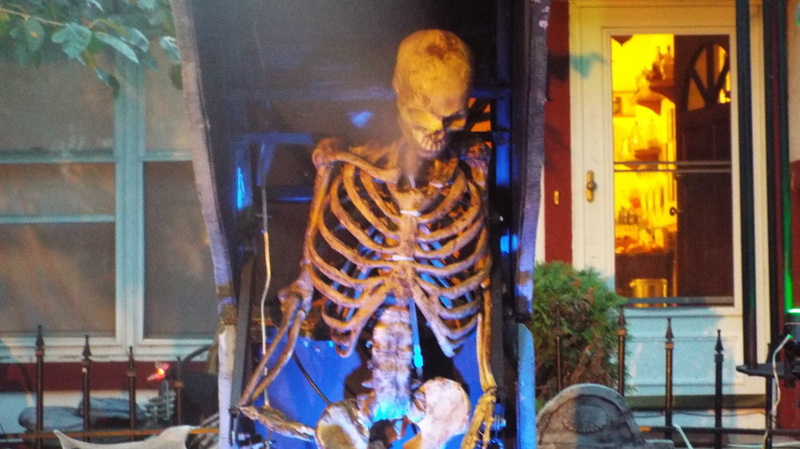 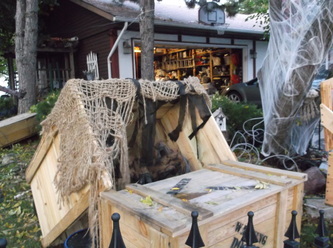 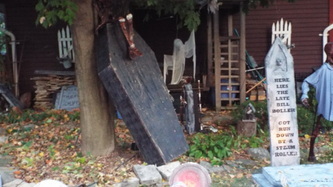 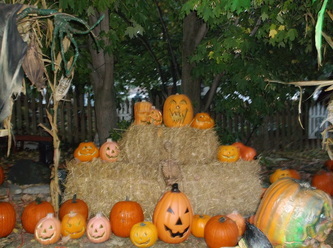 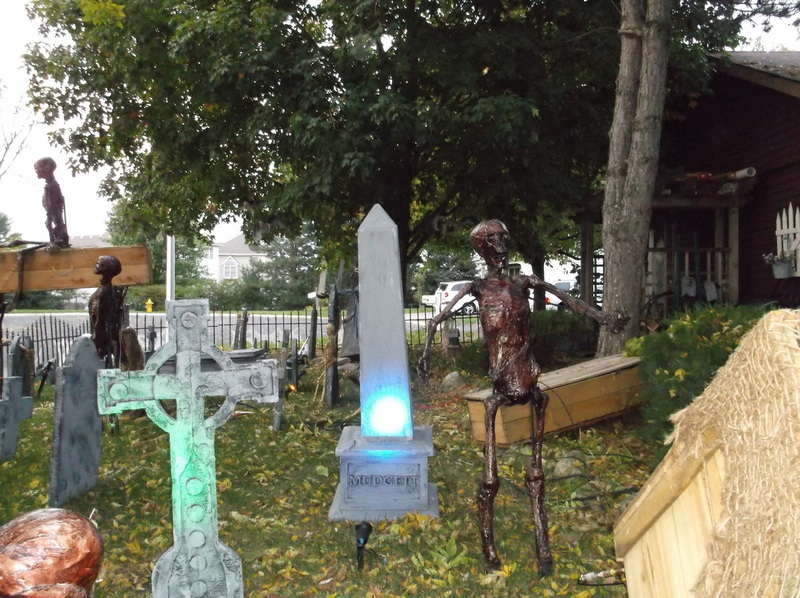 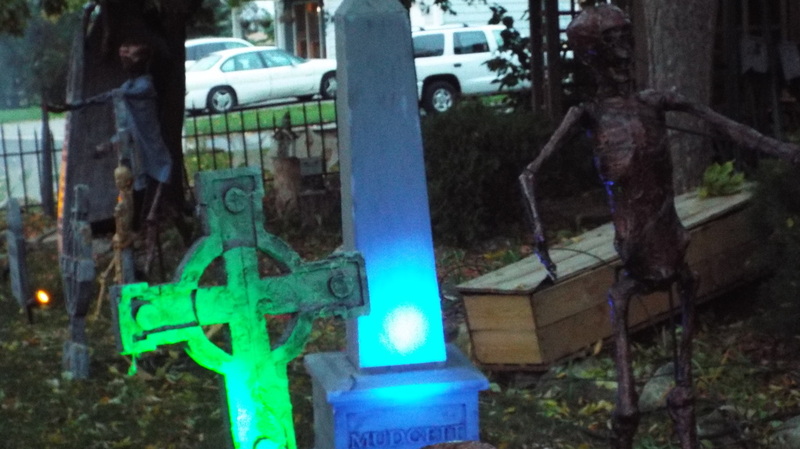 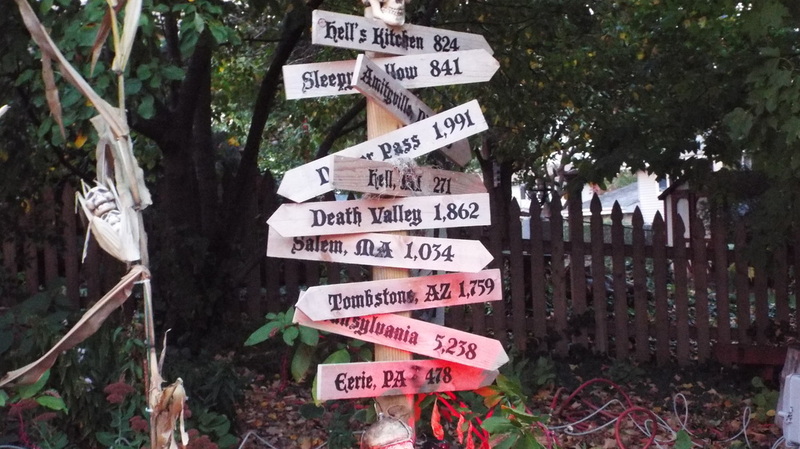 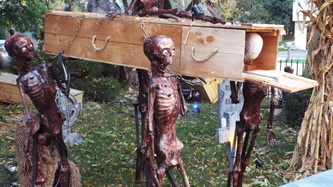 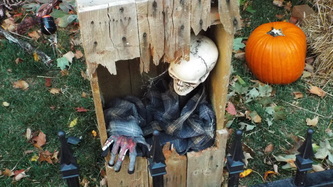 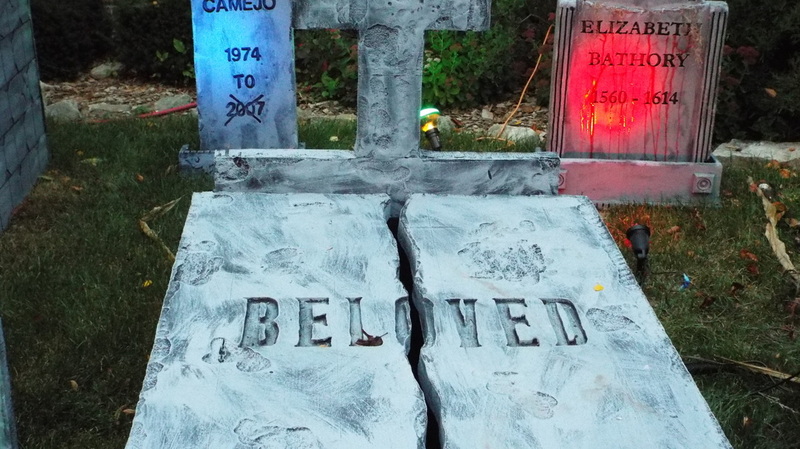 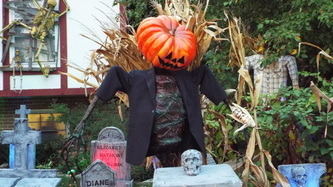 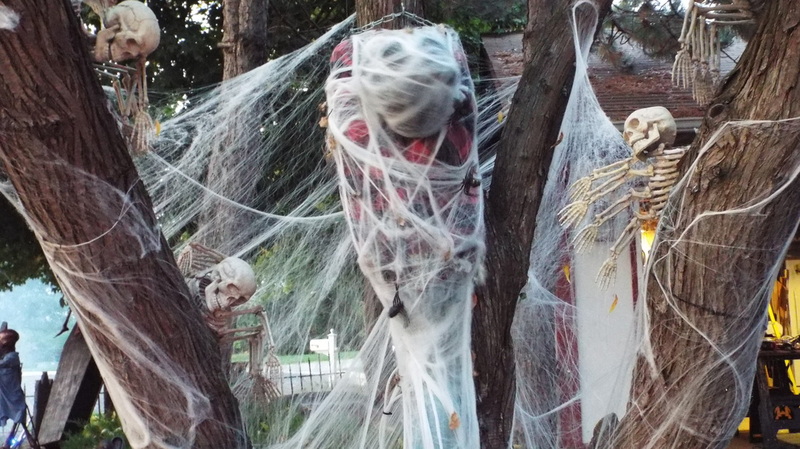 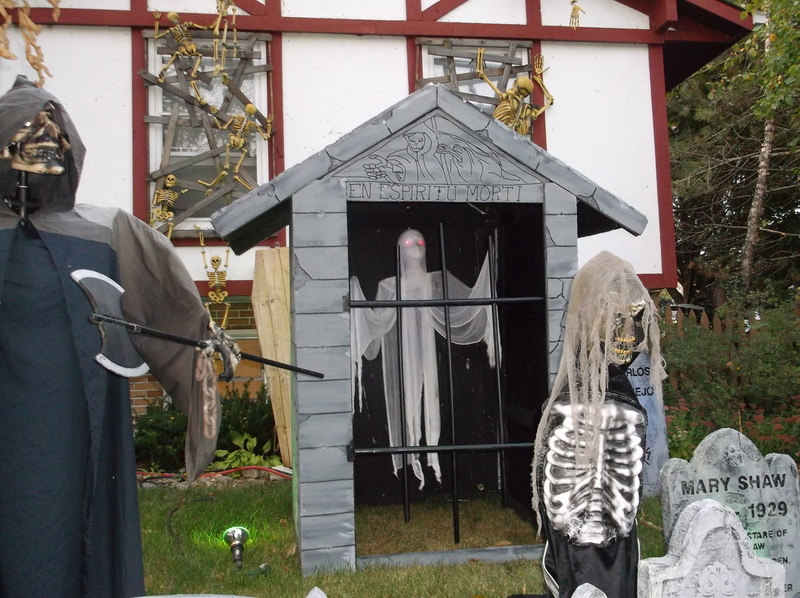 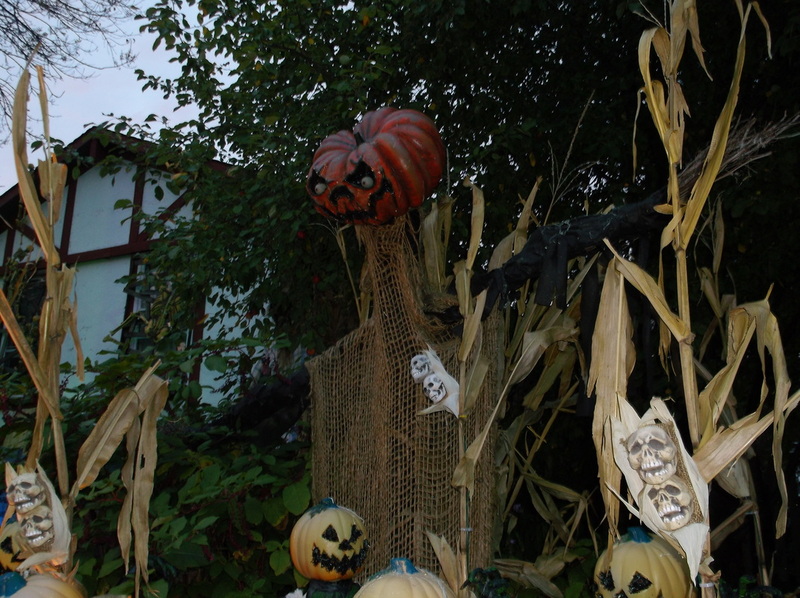 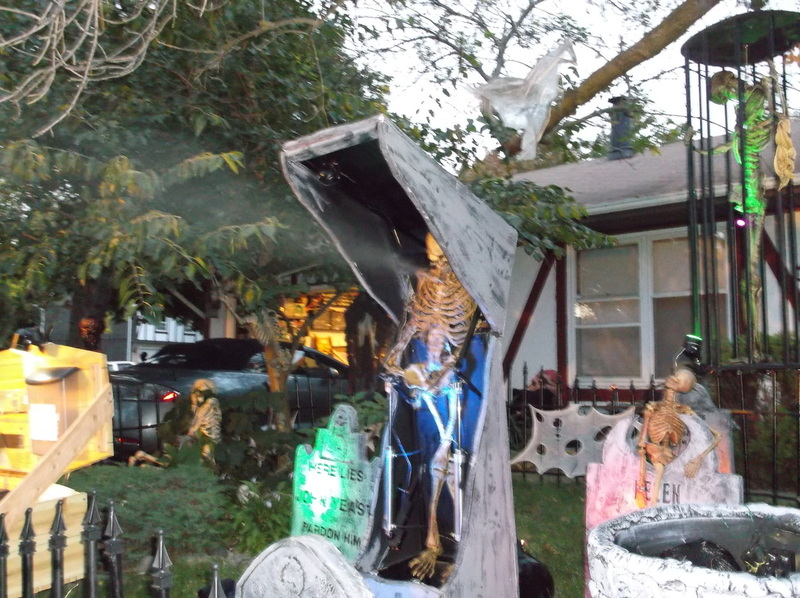 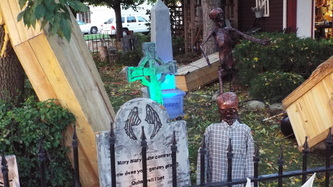 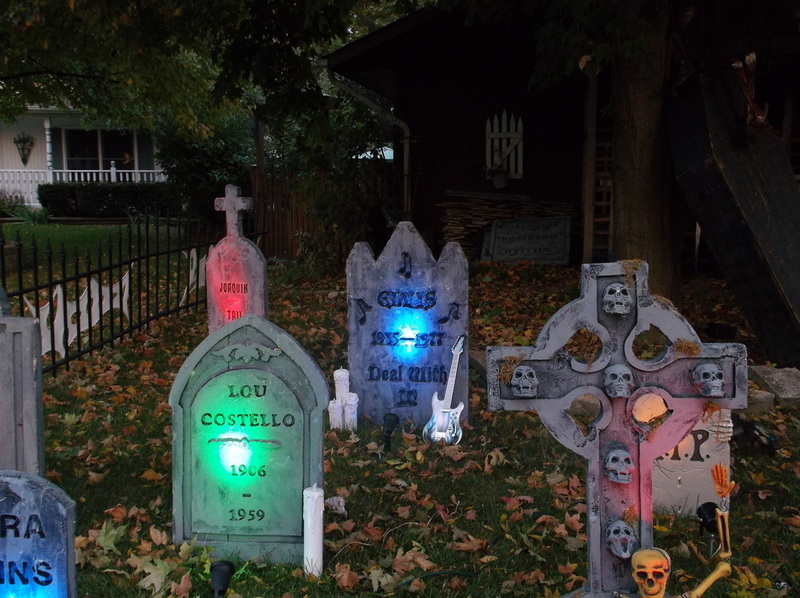 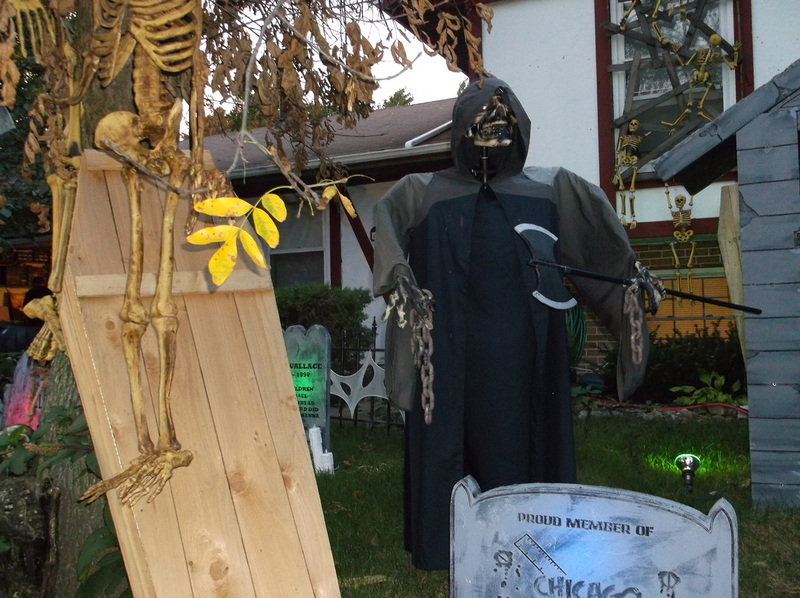 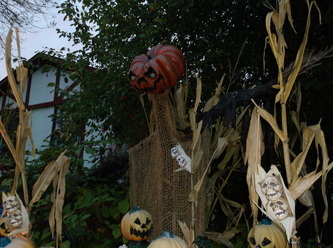 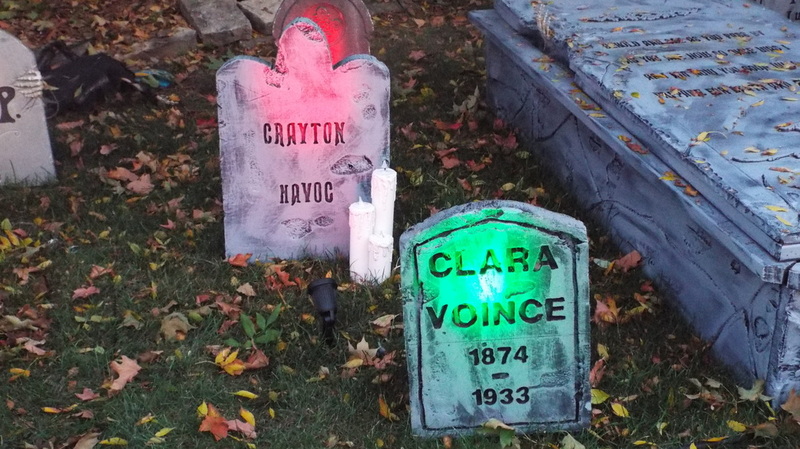 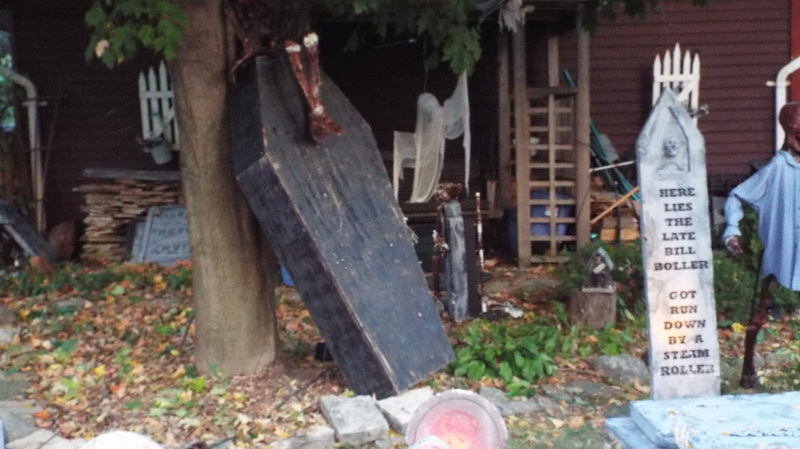 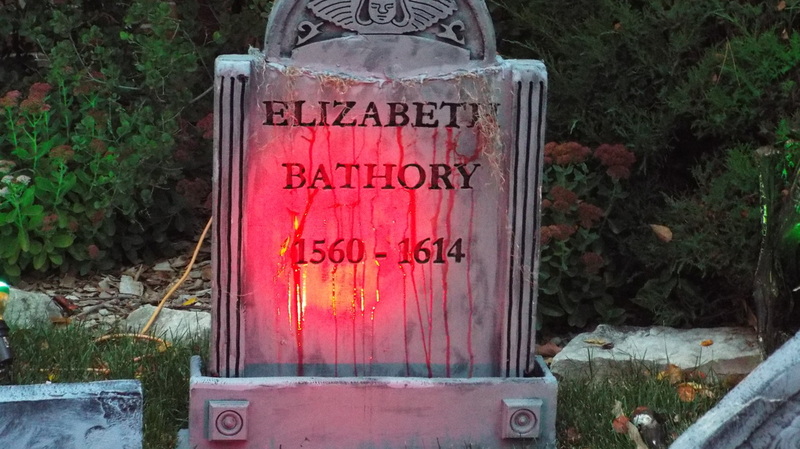 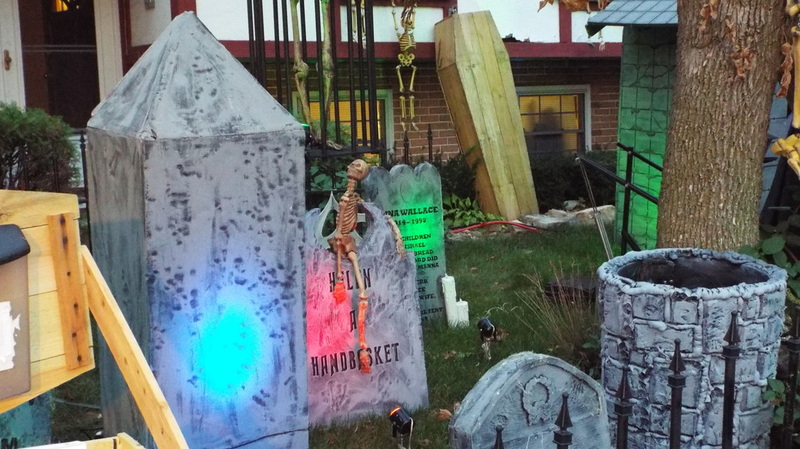 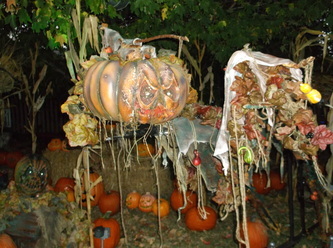 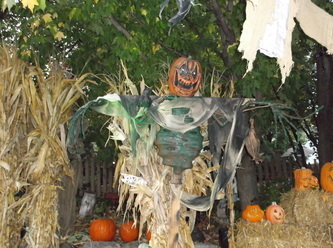 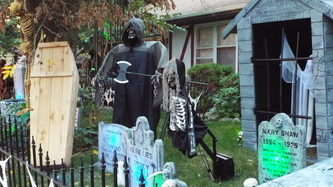 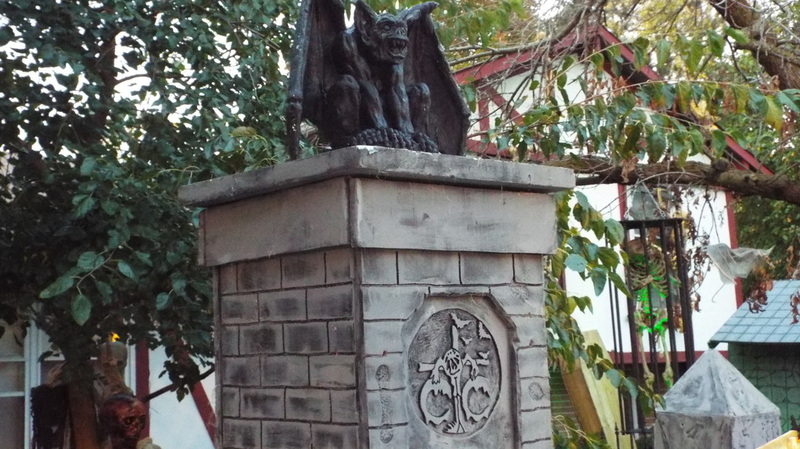 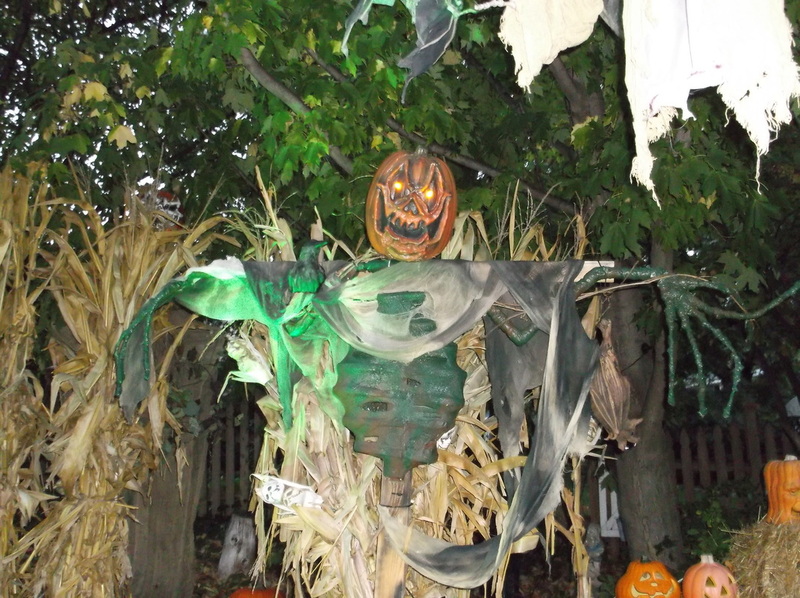 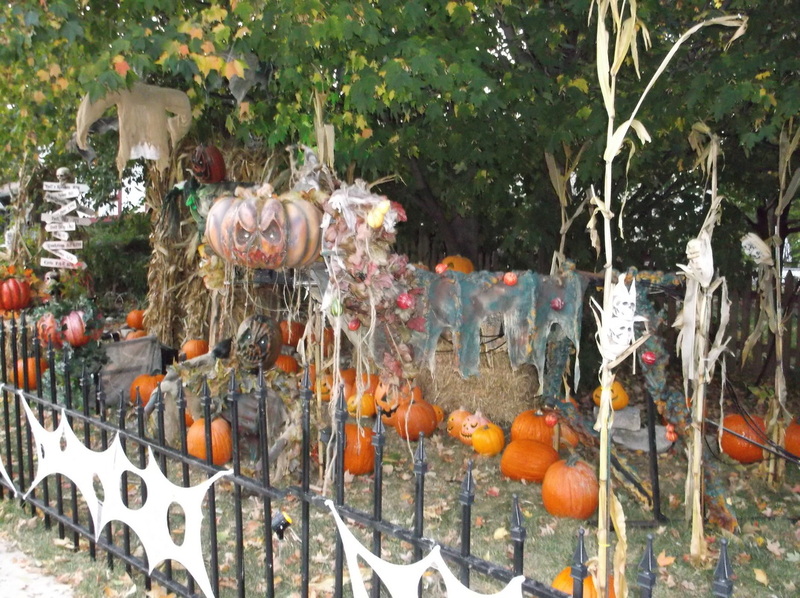 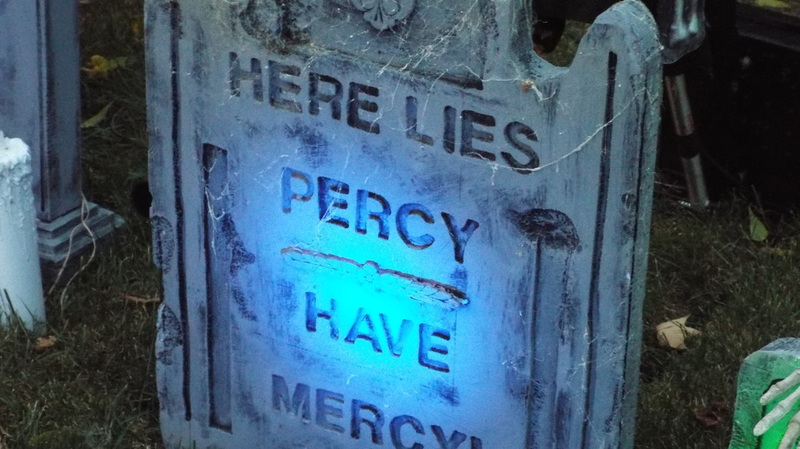 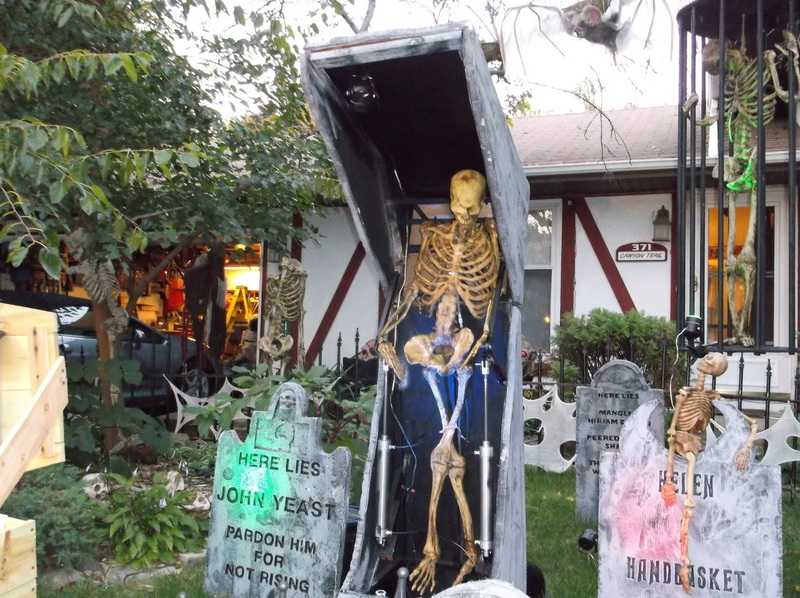 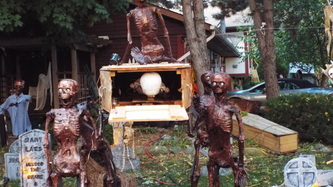 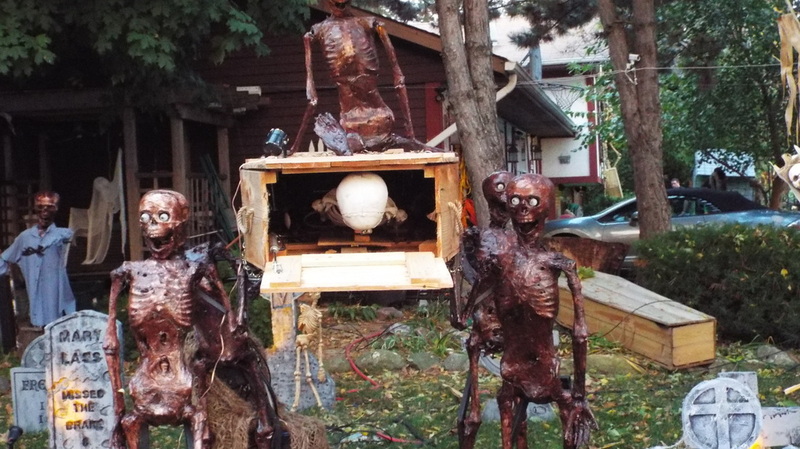 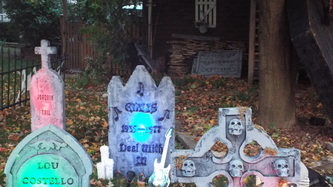 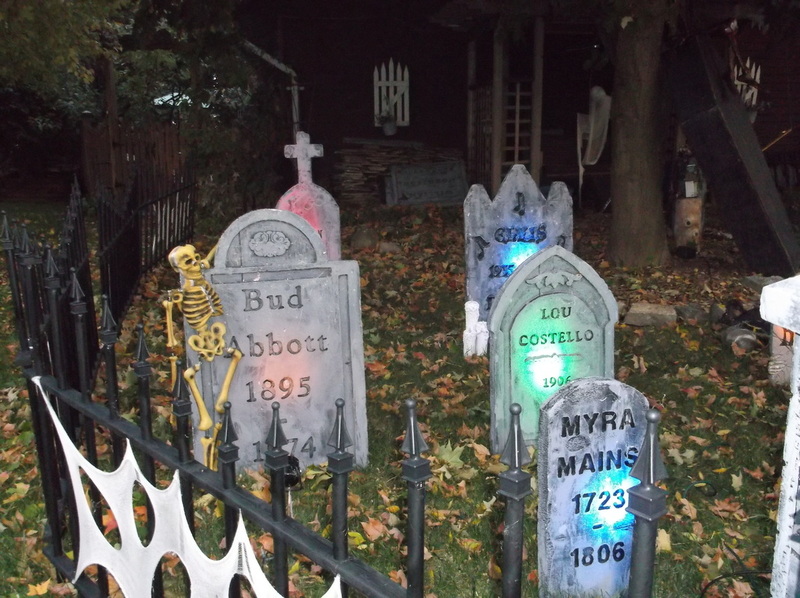 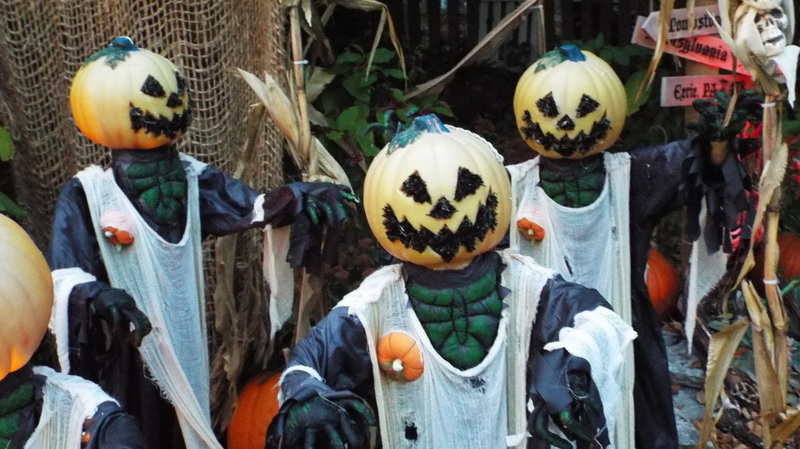 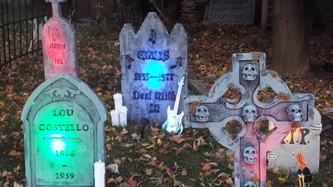 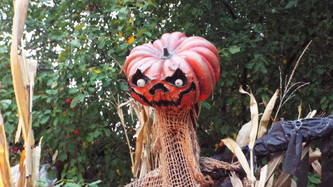 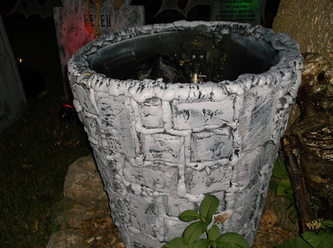 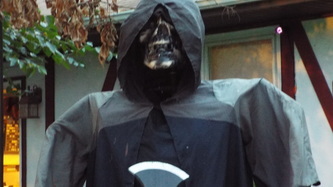 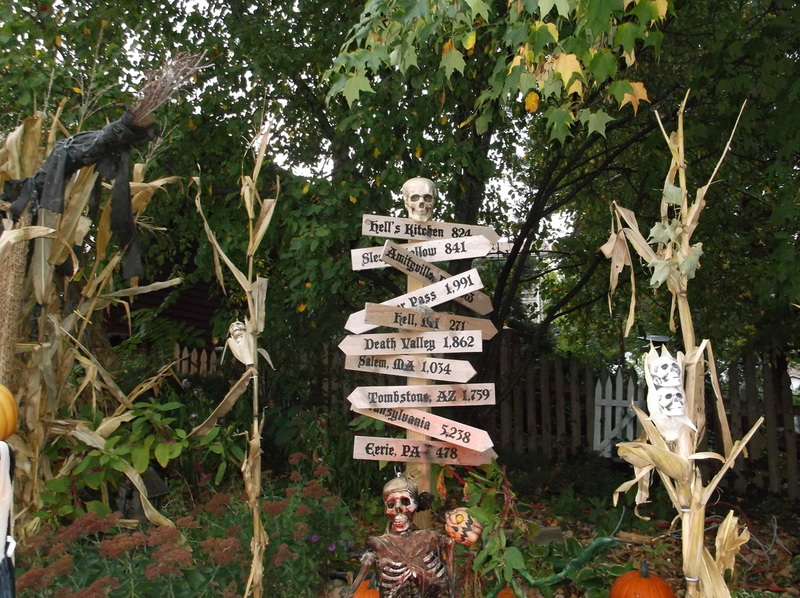 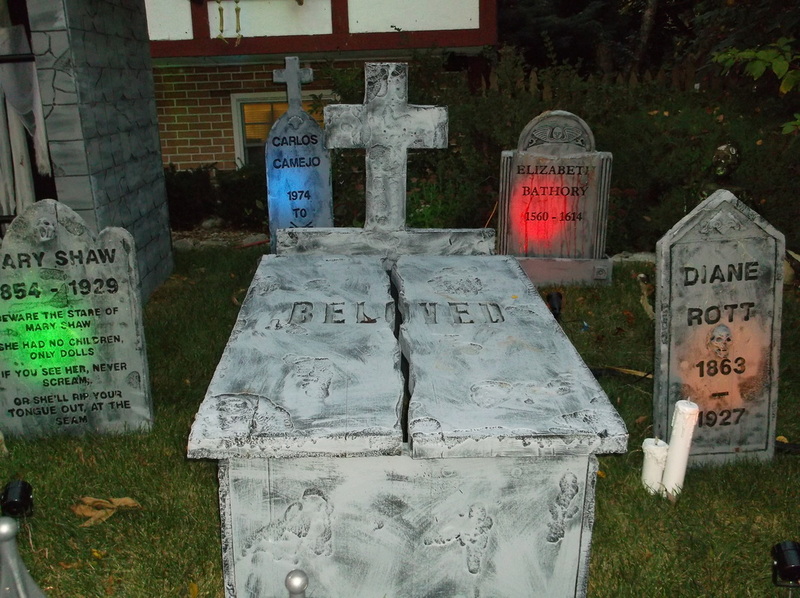 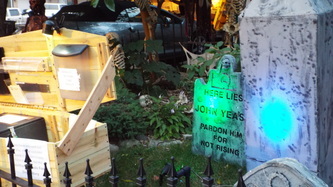 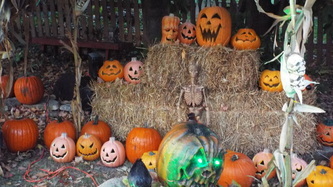 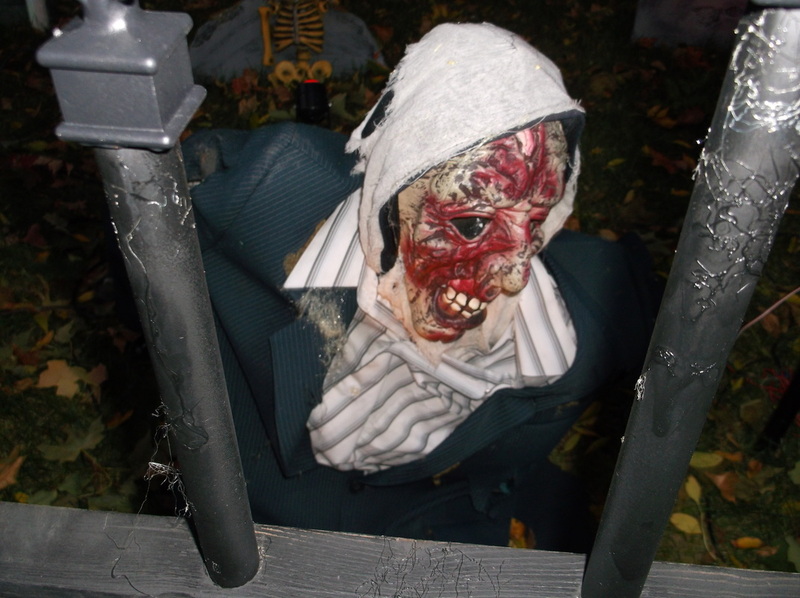 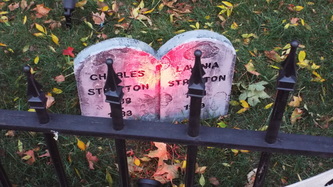 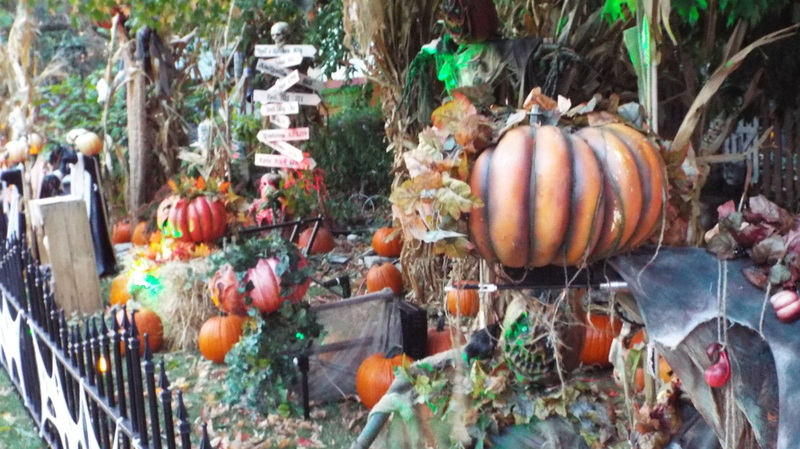 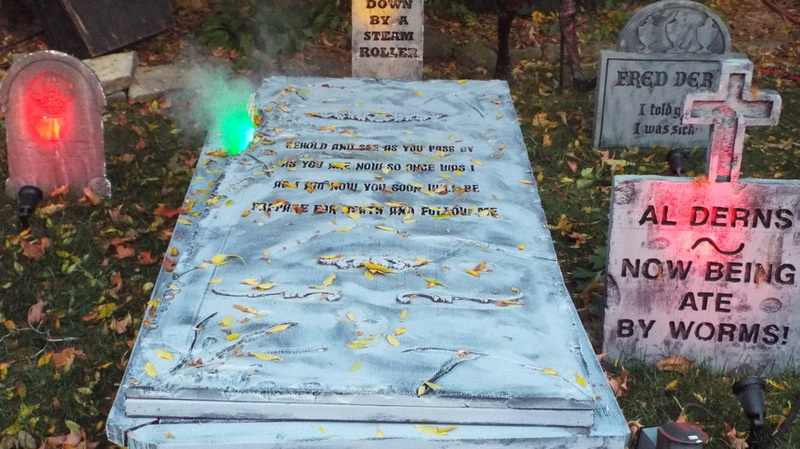 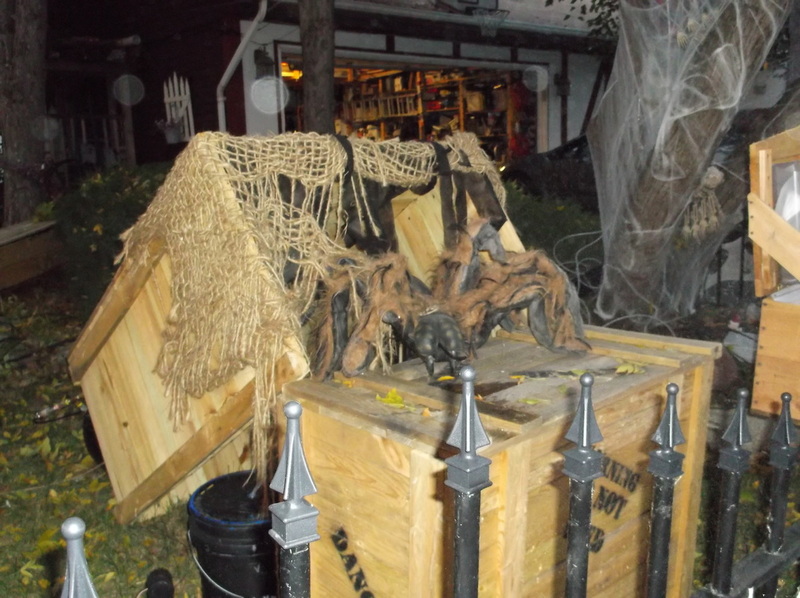 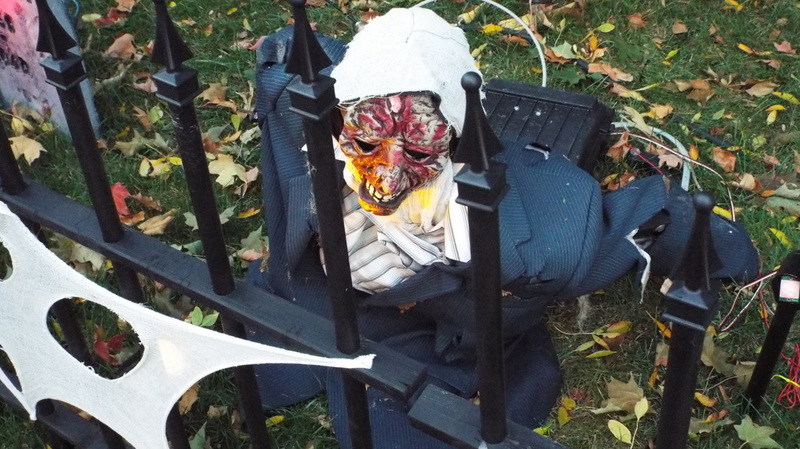 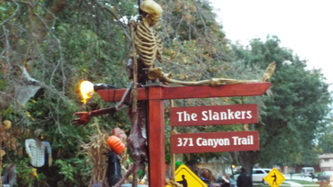 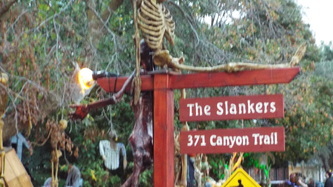 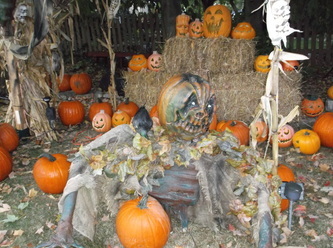 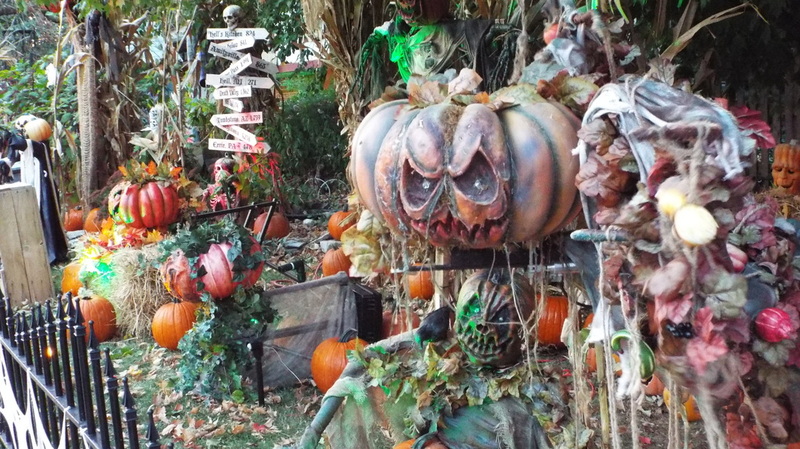 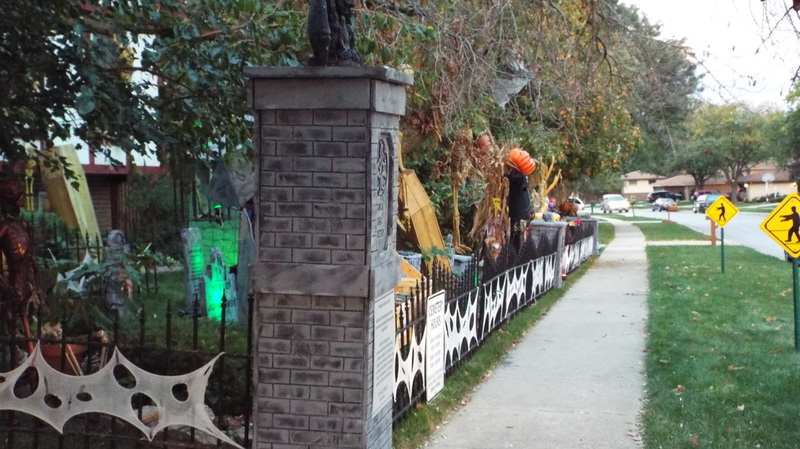 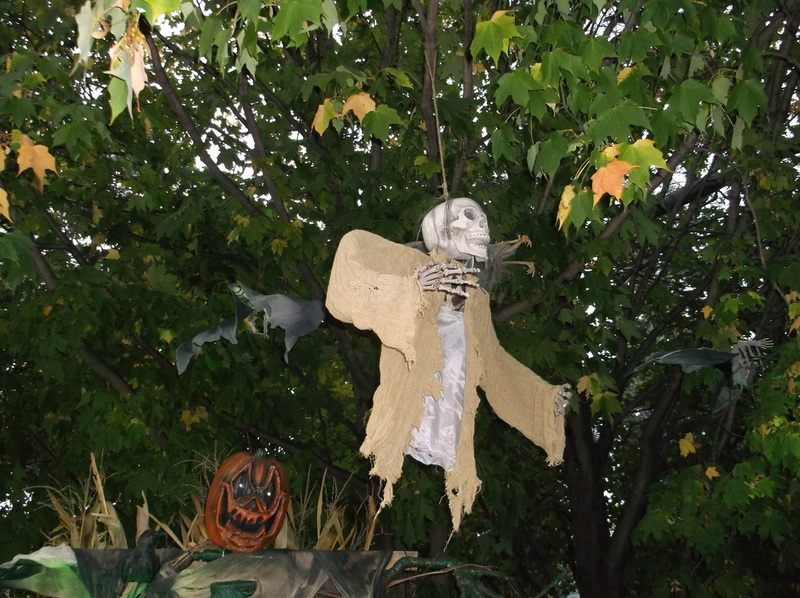 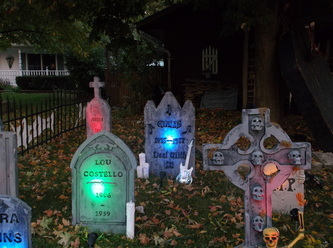 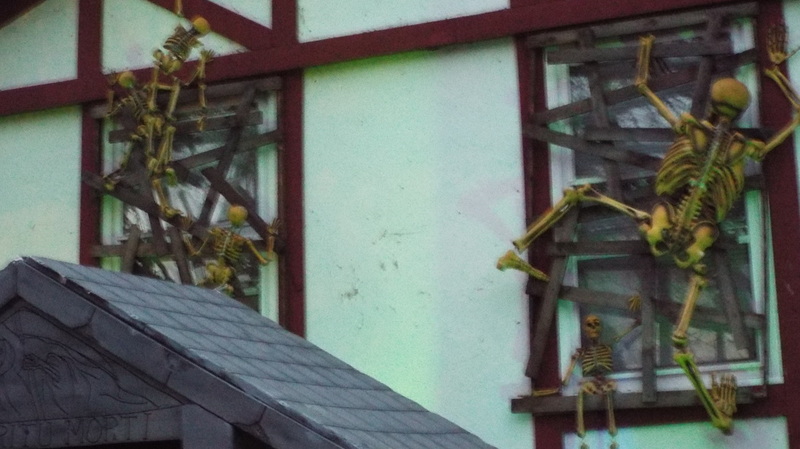 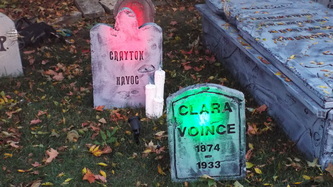 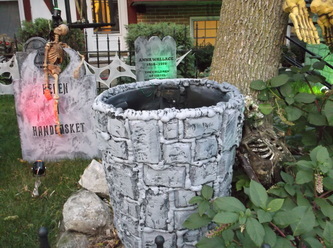 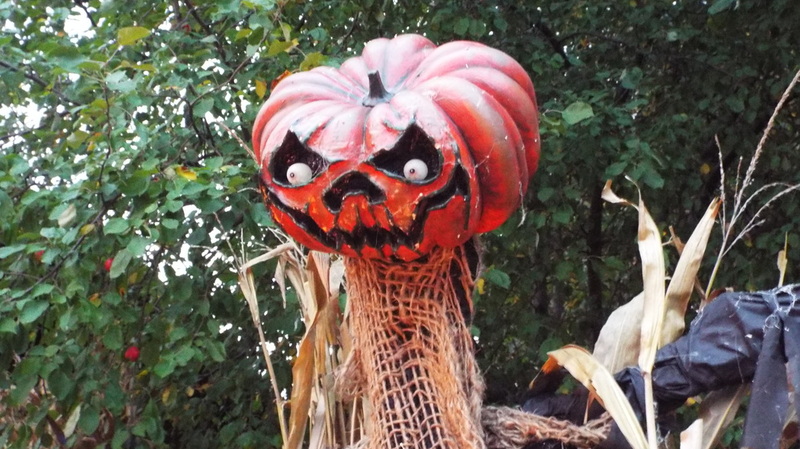 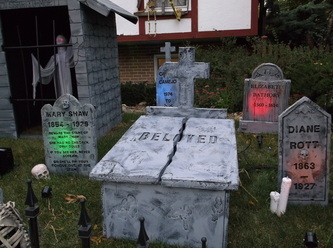 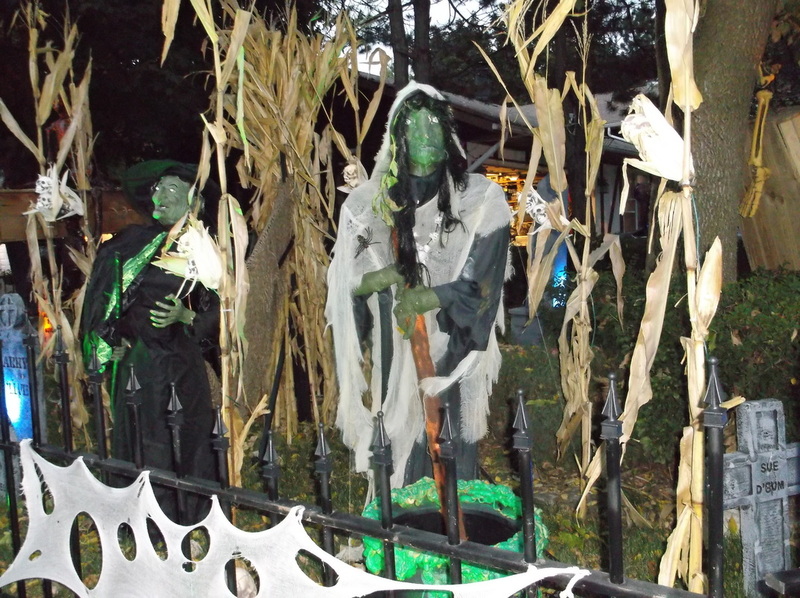 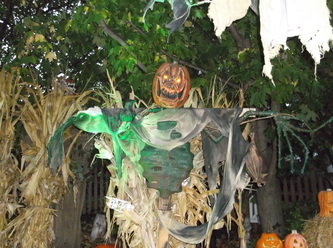 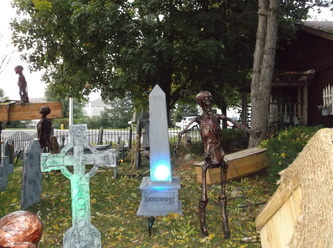 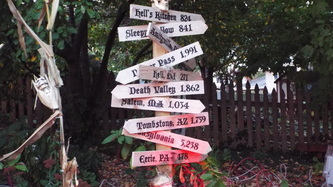 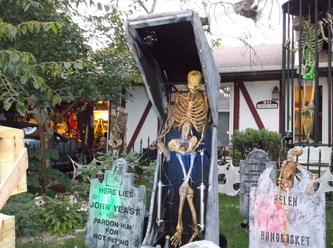 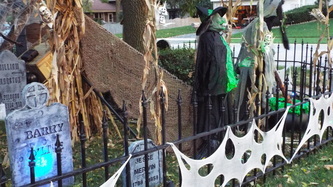 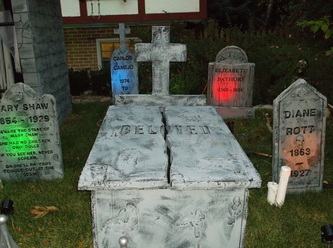 Canyon Trail Cemetery is one of our favorite Halloween yard displays, and is an effective mix of humor, whimsy, a bit of creepiness and some great props that creates a whole new world, much like a Halloween Disneyland in a front yard. 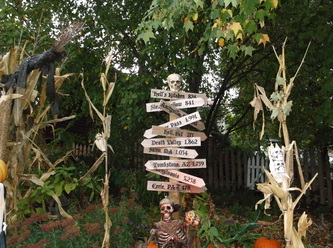 The main attractions of this display are its variety and its uniqueness. 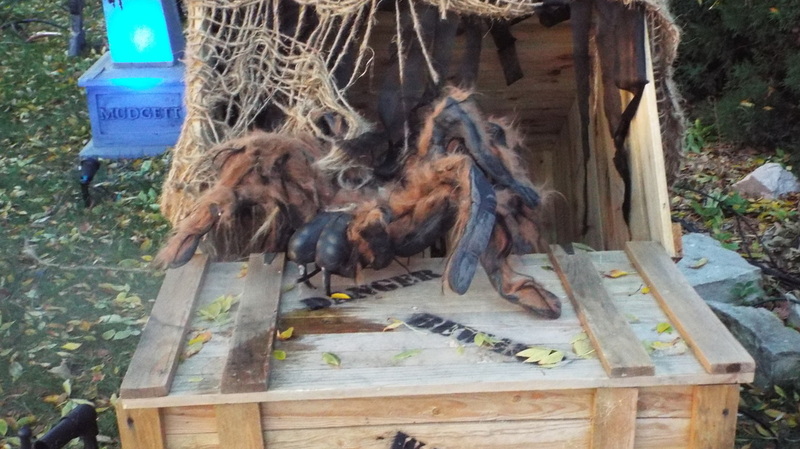 There are many, many props and setups to look at, both static and animated, and almost all of them involve some type of hand created ingredients. 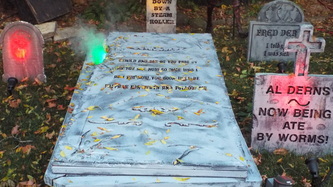 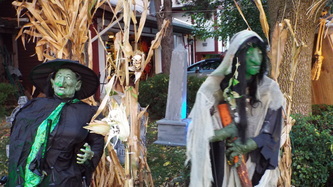 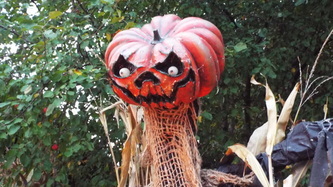 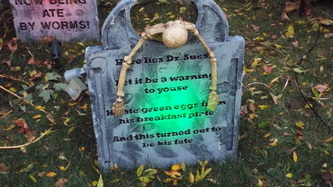 There are pumpkins and Jack-o-Lanterns, tombstones with humorous and clever sayings on them, witches, ghosts, and all sorts of other items. 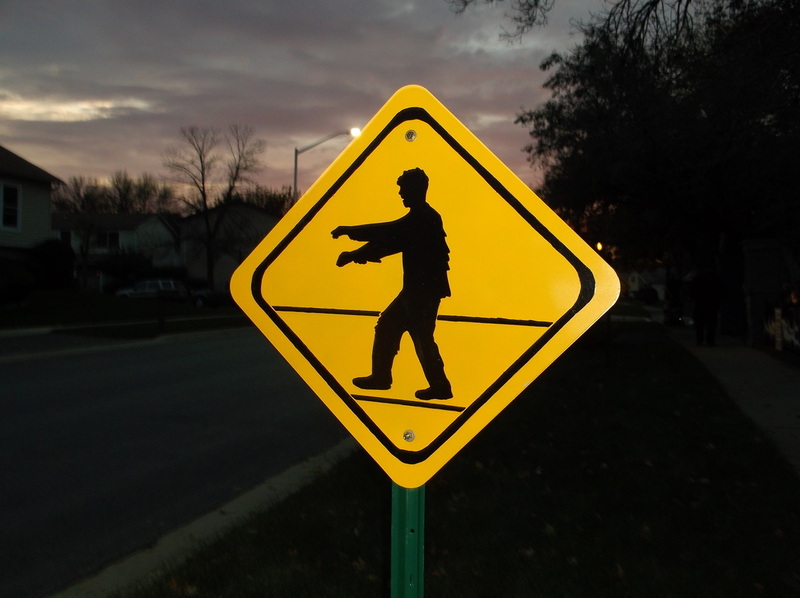 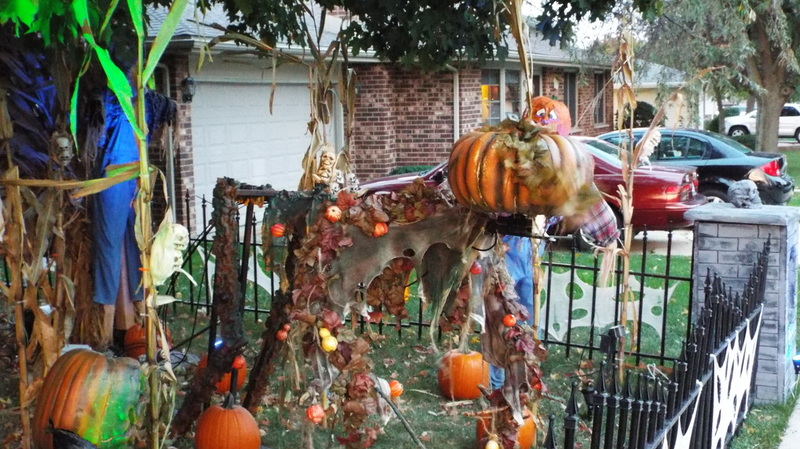 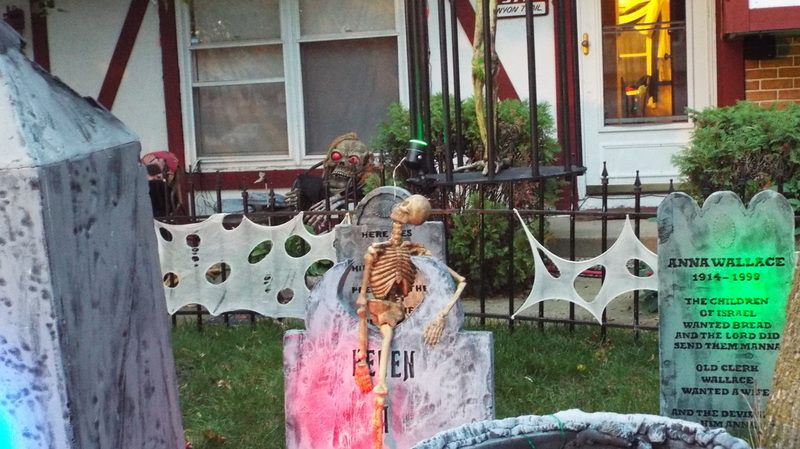 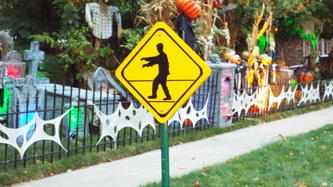 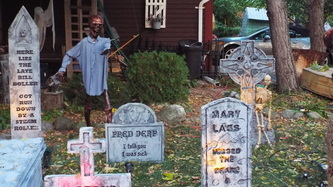 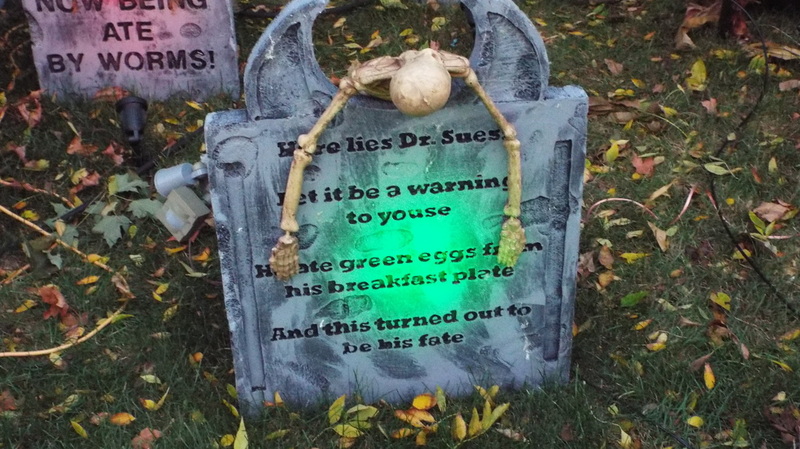 It's a fabulous mix of the festive spirit of Halloween, a bit of tongue in cheek humor, and some cool setups. 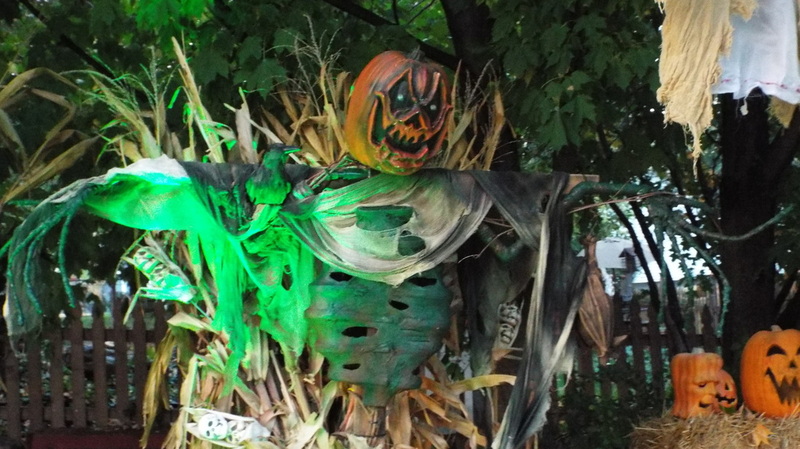 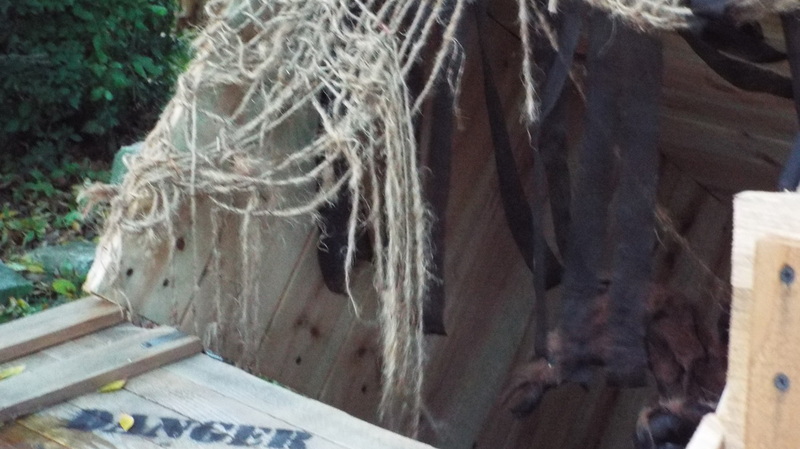 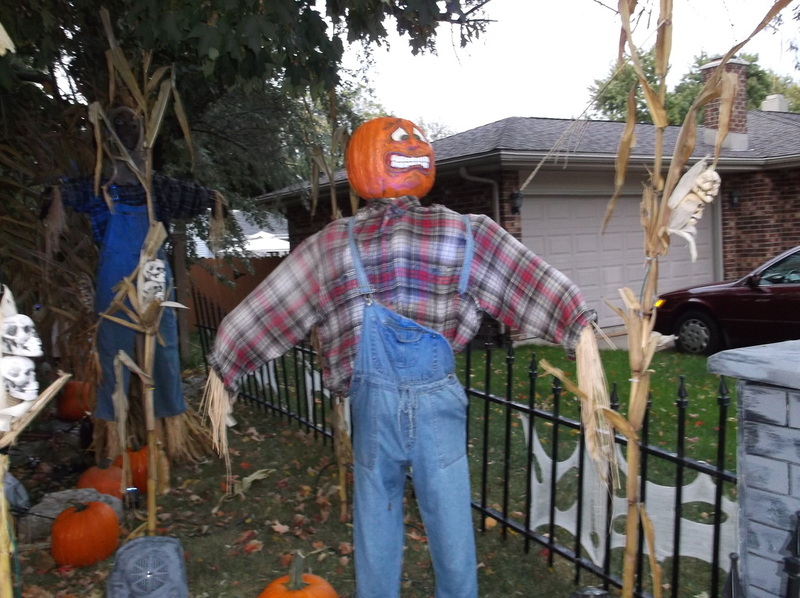 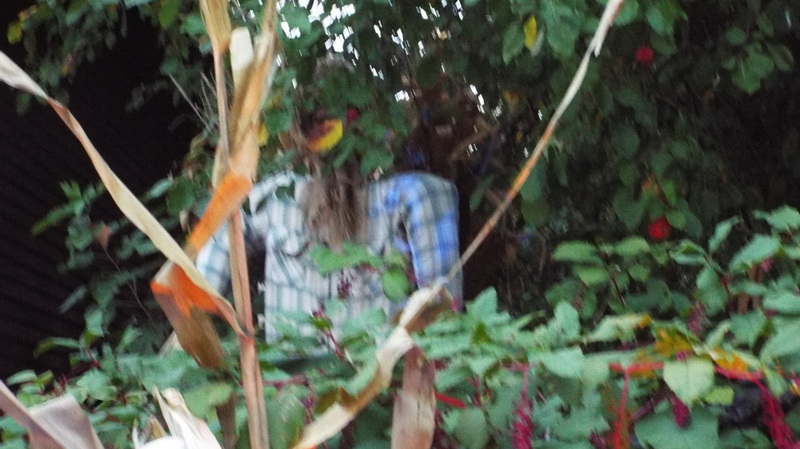 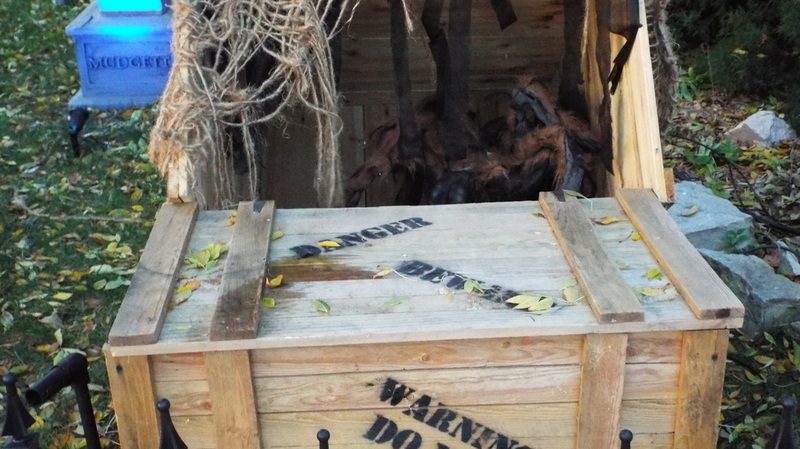 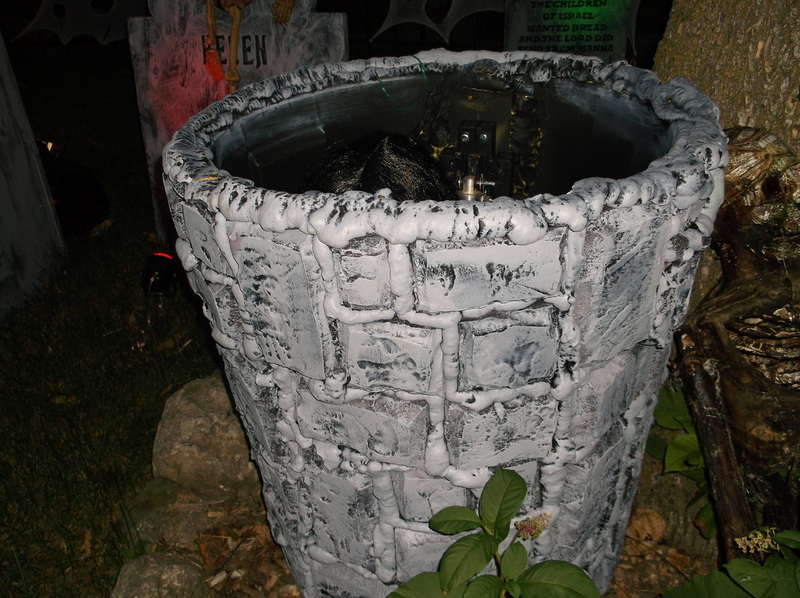 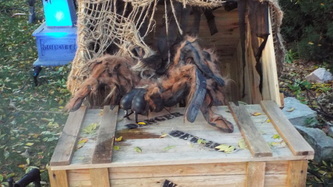 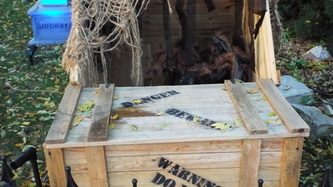 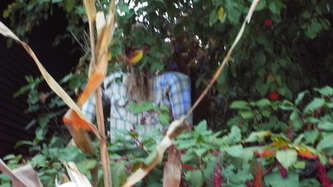 In addition to the clever static props, there are also many moving props, including crypts with moving covers, floating ghosts, scarecrows that appear from behind stalks of corn, and much more. 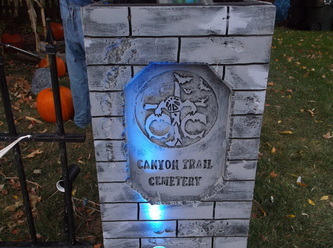 It is in this area that Canyon Trail Cemetery really stands out. 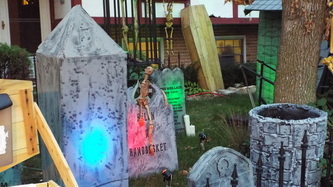 All of the props and pneumatics are done by the owners, husband and wife team of two who put the entire thing together. 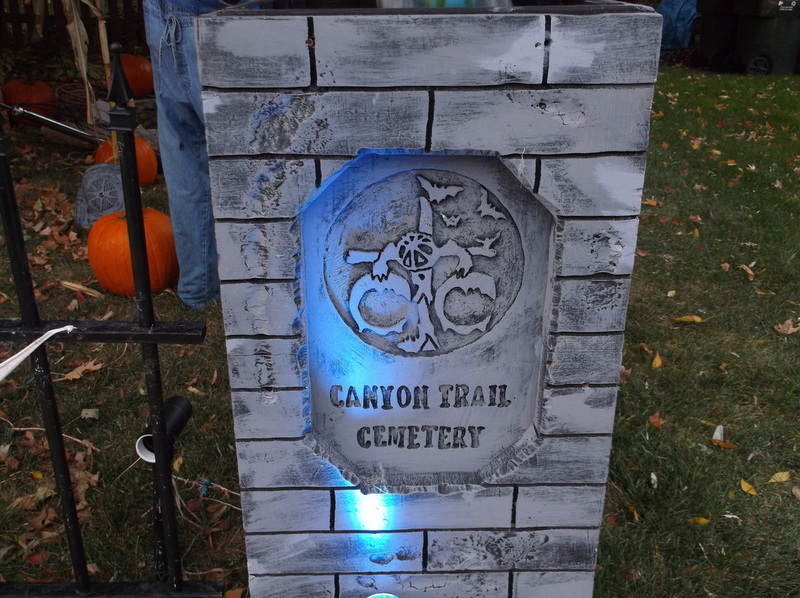 Their hard work and dedication really shines through, as Canyon Trail Cemetery is a feast for the eyes, and one the entire family can enjoy. Some new things this year included a large tomb with movable slab on top and animated occupant, some spitting skeletons, and our favorite, a homemade setup featuring Samara from The Ring, While it was unfortunately not running when we were there, the owner was kind enough to send us a video of it later, so we could see how it worked. 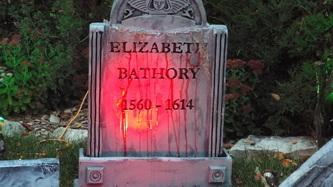 Basically, it featured a cell phone ringing, Samara rising from a well, followed by her voice saying "seven days" - clever stuff, and a nice twist on a somewhat common Halloween prop.Overall, Canyon Trail Cemetery invokes more of the fun side of the Halloween season, conjuring up images of witches and goblins, falling leaves, hot cocoa and campfires, and the excitement of looking forward to putting on one's Halloween costume and collecting candy door to door. 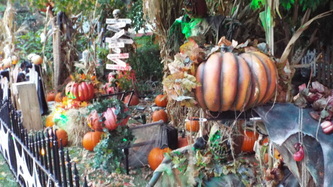 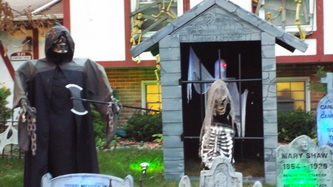 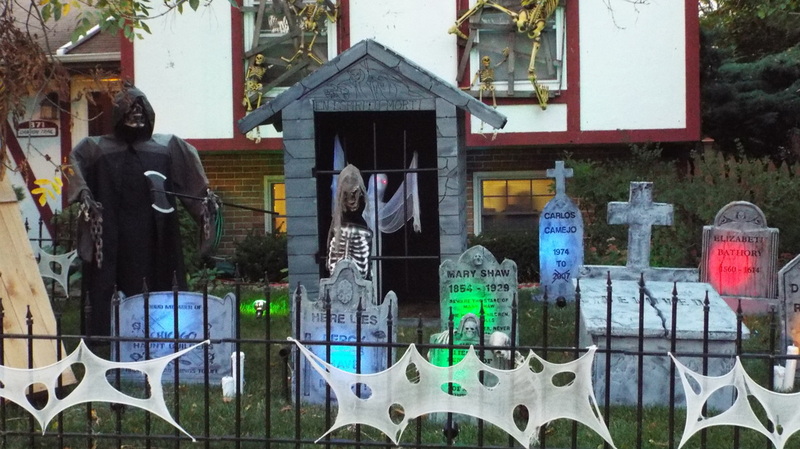 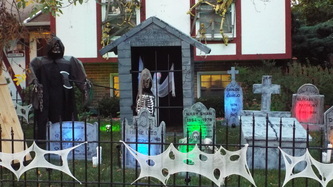 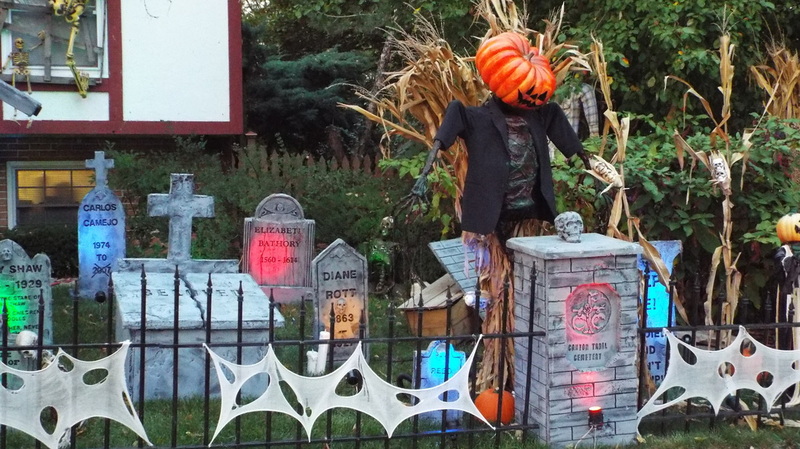 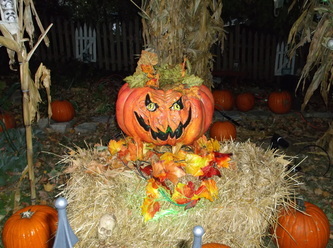 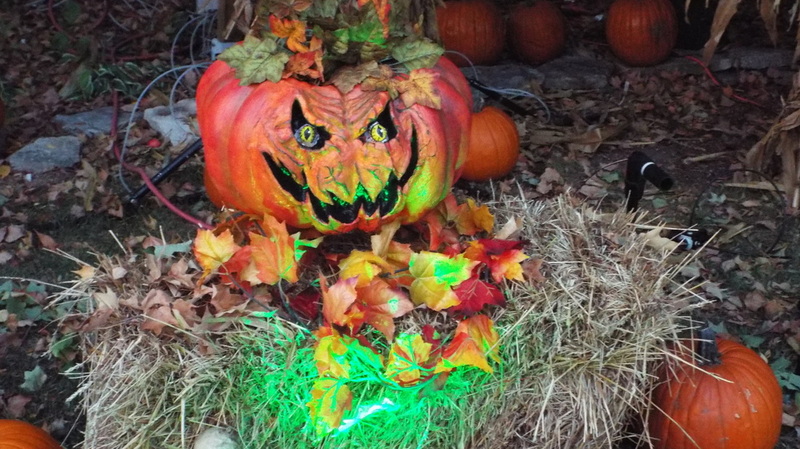 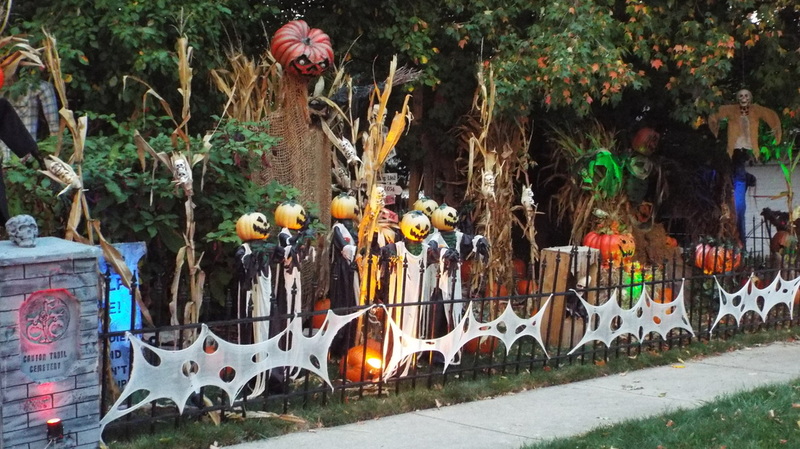 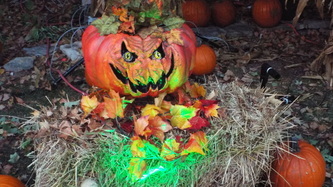 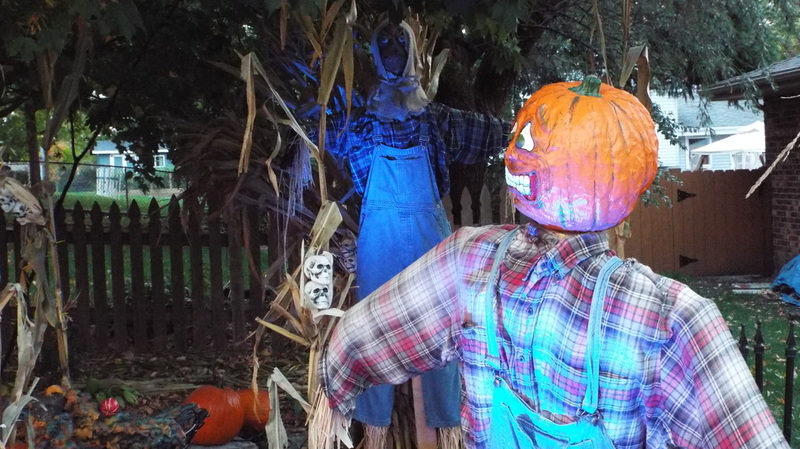 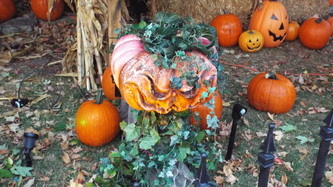 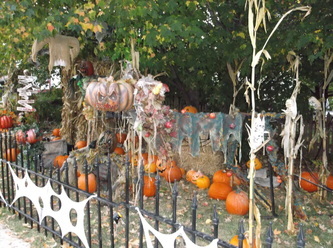 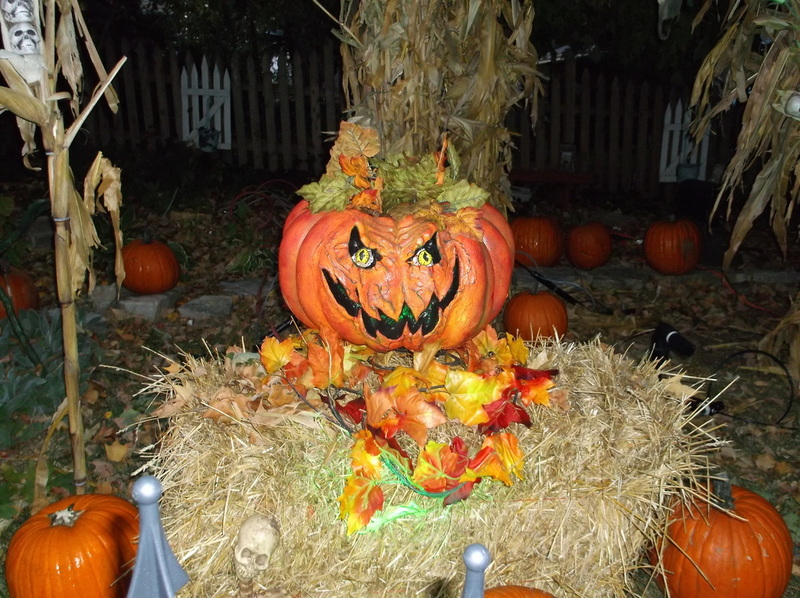 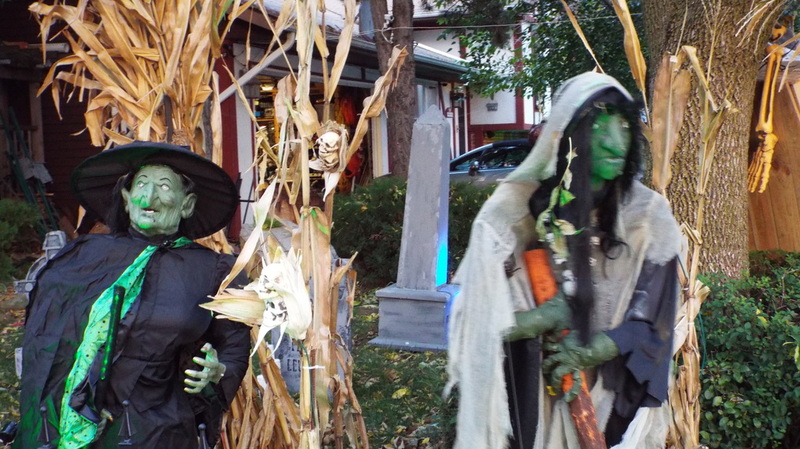 Although the display is very modern, it engenders a sense of nostalgia, almost like the type of Halloween season that Norman Rockwell might have depicted in a Saturday Evening Post cover. 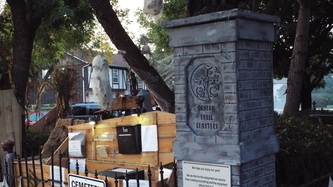 It's great stuff, and one of the most unique displays we have seen. 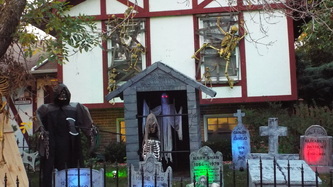 It's also fun for the entire family, especially if you have younger children. 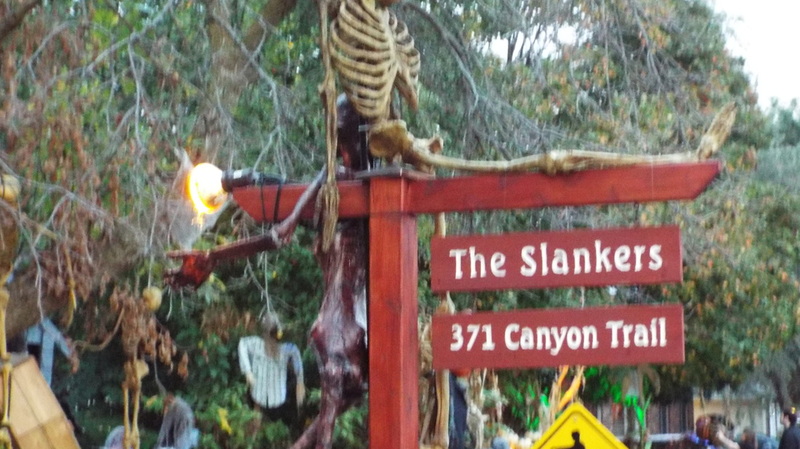 Be sure to do yourself a favor and visit Canyon Trail - take your kids and share with them this wondrous creation and watch their faces light up as they marvel at it. It'll bring a smile to their faces, and to yours!